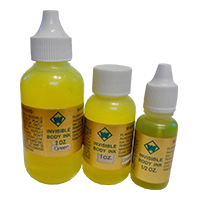 This UV ink bottle refills are for use in the pre-inked UV stamp mounts to be used on skin. The UV ink and glows in your color choice under UV light. We offer this ink in three sizes including 1/2 oz - $8.00, 1oz - $12.50, 2oz - $18.50. Excellent for entry/exit marking for night clubs, amusement parks, sports functions, casinos, social events, and more! The ink will last for several thousand impressions and can easily be re-inked. Chose your size and color options below and click the add to cart button! 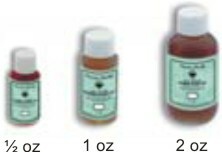 Sizes Available: 1/2 oz. | 1 oz. | 2 oz. What size refill would you like?